The first ever image of a black hole was unveiled on Wednesday, marking a historic breakthrough in astrophysics research. 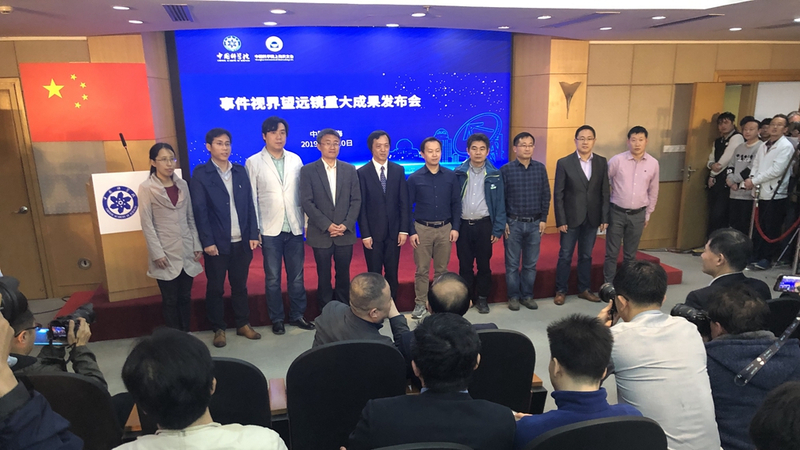 The moment was announced concurrently at press conferences held in the six cities of Shanghai, Taipei, Tokyo, Washington, Brussels and Santiago. Click here for some basics about black holes. The image reveals the black hole at the center of Messier 87 (M87), a massive galaxy in the nearby Virgo galaxy cluster. This black hole resides 55 million light-years from the Earth and has a mass 6.5-billion times that of the Sun. The “photographer” of the first black hole image is Event Horizon Telescope (EHT), a planet-scale array of eight ground-based radio telescopes forged through international collaboration, which was designed to capture images of a black hole. 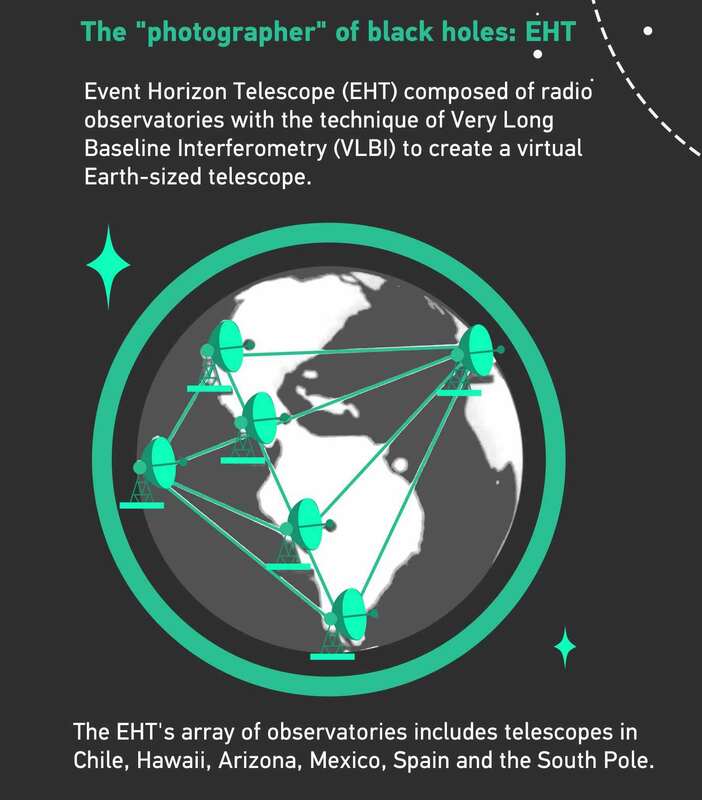 Creating the EHT was a formidable challenge which required upgrading and connecting a worldwide network of eight pre-existing telescopes deployed at a variety of challenging high-altitude sites to form an Earth-size virtual telescope with unprecedented sensitivity and resolution. The technique behind the “photographer” is called very-long-baseline interferometry (VLBI) which synchronizes telescope facilities around the world and exploits the rotation of our planet to form one huge, Earth-size telescope observing at a wavelength of 1.3mm. VLBI allows the EHT to achieve an angular resolution of 20 micro-arcseconds – enough to read a newspaper in New York from a sidewalk cafe in Paris. Black holes are extraordinary cosmic objects with enormous masses but extremely compact sizes. The presence of these objects affects their environment in extreme ways, warping space-time and super-heating any surrounding material. “If immersed in a bright region, like a disc of glowing gas, we expect a black hole to create a dark region similar to a shadow – something predicted by Einstein’s general relativity that we’ve never seen before,” explained chair of the EHT Science Council Heino Falcke of Radboud University, the Netherlands. “This shadow, caused by the gravitational bending and capture of light by the event horizon, reveals a lot about the nature of these fascinating objects and allowed us to measure the enormous mass of M87’s black hole,” he said. “Once we were sure we had imaged the shadow, we could compare our observations to extensive computer models that include the physics of warped space, superheated matter and strong magnetic fields. Many of the features of the observed image match our theoretical understanding surprisingly well,” said Paul T.P. Ho, EHT Board member. “This makes us confident about the interpretation of our observations, including our estimation of the black hole’s mass,” he added. 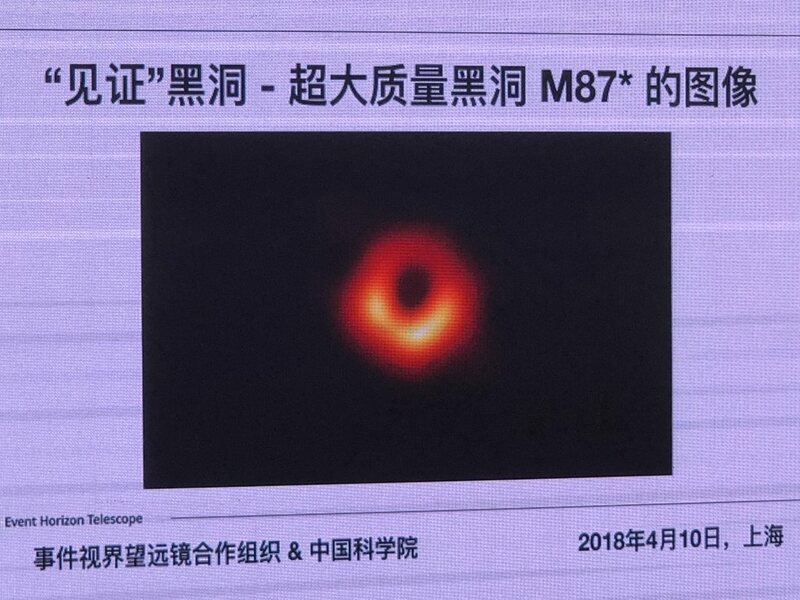 One of the experts at the Shanghai event said that scientists now have much understanding of the light and materials surrounding the black hole, but knowledge of the shadow measuring 100 billion km in diameter, remains blank. This exciting result was also supported by the Center for Astronomical Mega-Science (CAMS) of the Chinese Academy of Sciences (CAS), co-established by National Astronomical Observatories, Purple Mountain Observatory, and Shanghai Astronomical Observatory. Click here to watch CGTN’s broadcast of the unveiling event in Shanghai.